Are you a toy store or an online store or both? Are you interested in advertising and selling your products? Smart-kid-educational-games.com offers not only advertising opportunities but also the opportunity to sell your products directly from our website. We add your store's name and address to our toy stores directory so that people can find you and go visit your store. We create a page about your toy store, including a description of your store and especially of the kind of educational toys that you sell, with pictures, etc. If you have an interesting educational toy or game and if you have an online toy store, we create a page(s) advertising your toy(s) or game(s) with a link to your online shop. 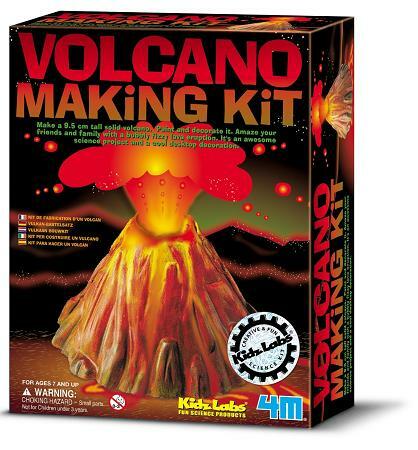  Kids make a volcano erupt and learn about volcanoes.  The kit introduces children to chemistry and geology.  Incredibly realistic volcano eruptions. to advertise and sell many of your toys online. Smart-kid-educational-games.com is an educational toys website with thousands of unique visitors per month and the number of visitors is growing! Our homepage has a Google Page Rank of 3. By advertising on our site, you get exposure to thousands of potential visitors. Our visitors often send us emails asking us where they can buy educational toys. Therefore, by being on our site, you get to capture these potential customers. There is absolutely no binding agreement here (like a yearly subscription). If you are not satisfied and if you feel that you do no get new customers, you can cancel anytime you want. 1- Whether you are a store or an online shop or both. 2- A brief description of your store including name, location and the toys and games that you sell. 3- Some of the educational toys and games that you would like to advertise and don't hesitate to attach any pictures you might have. Do you have some pictures of some of the educational toys or games that you want to advertise or sell?